Ayurvedic herbal tea supporting the dosha 'Kapha' stimulating & energising. A blend of ginger and tumeric roots, cardomom, coriander, cloves & nutmeg combine in this vitalising tea. 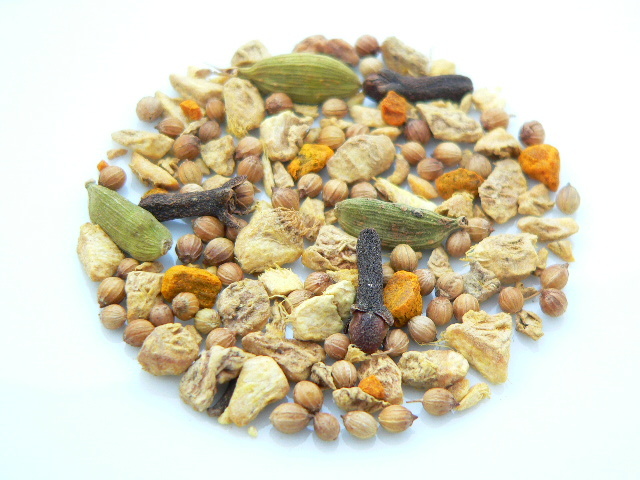 This herbal blend has a warm and invigorating spicy ginger finish. This is a wonderfully warm and spicy blend that is perfect for those with a predominance of the Ayurvedic dosha kapha. It is especially good in winter and seems to have medicinal qualities for those suffering from coughs and colds. I know a couple of people that drink this who will swear it seems to aid weight-loss too!